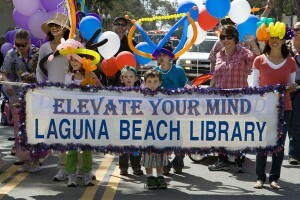 Supporters of the Laguna Beach Library march on Forest Ave. Photo by Ted Reckas. Laguna Beach puts on its patriotic finery this Saturday, March 3, wearing the colors that have honored the nation for more than 225 years. 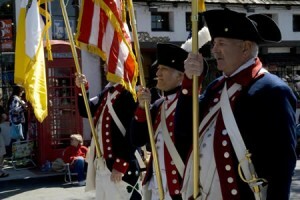 In Laguna, the Patriot’s Day Parade marks its 46th year. Traffic will undoubtedly be slower as downtown streets are temporarily closed for the morning event. “We have a traffic control plan that should barricade the downtown intersections and redirect the vehicles on Coast Highway and Canyon Road between 11 a.m. and 1 p.m.,” said Lt. Jason Kravetz, who does not anticipate other problems on the .7-mile route along Park Avenue, Glenneyre Street and Forest Avenue. The parade of 101 entries ends at City Hall. (Find a list of the closed streets at the end of this article). Despite a cold front and rain early in the week, Saturday’s forecast calls for sun and 73 degrees. For residents, the celebration lasts a day. For the parade’s eight organizers, work begins in August to ensure a smooth run on parade day. “It is first one meeting per month. The more we get closer to the big day, the more we see each other. At the end, we are quite like a small family,” says Ed Hanke, this year’s parade president. The theme resonated when committee members considered nominees for artist of the year, settling on Jorg Dubin, who devised Heisler Park’s recently dedicated 9/11 memorial entitled “Semper Memento,” which translated means always remember. Dubin is no stranger to the parade. As a member of the Kings Order of El Mysah, a faux fraternal order of Elvis Presley worshipers outfitted in leopard-print fezzes, Dubin and his friends turned heads and blasted Elvis favorites along the parade route from his vintage Cadillac convertible. A lesser-known parade contributor is Niva Razin, author of the 2012 essay contest. The sixth-grader at Thurston Middle School is a student of Sarah Schaeffer’s language arts class. 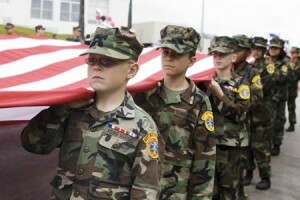 Her essay is available on lagunabeachparade.org and in the program handed out along the parade route. This year’s parade welcomes almost a dozen new participants, including bands from Barstow and Palmdale, Hanke said. Another new entry comes from longtime resident Michelle Boyd, whose Twisted Stitchers’ work is visible along some downtown streets. “Being a part of the parade seemed to be the natural thing to do with the work I have done on Glenneyre Street and a special car it took me three weekends to decorate,” she said. The first event stepped off on Feb. 22, 1967, the fruition of Emily Ross’s dream. Ross wished upon her lucky star for a parade that would “instill in our youth love of country and respect for the flag.” Since the town’s streets are congested with beach-going throngs on July 4, the nation’s independence day, organizers have settled on their own Patriot’s Day celebration in March, following the national Presidents’ Day holiday. Ben Bodart is the Indy’s intern from Belgium. Past patriots in the parade. 54. Tivoli Terrace and Tivoli Too!